A to B Removals Aberdeen offer removal services including house removals, office removals, commercial removals, man and van removals and furniture removals throughout Scotland, UK, and Ireland. All removals are carried out at your convenience. A to B Removals Aberdeen offer part load services to Inverness, Glasgow, Edinburgh, Manchester, London and other parts of the UK. Please ask about our part loads service running on a regular basis. Perhaps you have purchased a new large piece of furniture for your home; you need someone to collect and deliver the new furniture to your home. A to B Removals Aberdeen can provide you with a man with van service at a very affordable price. Moving Office or Relocating Your Business? 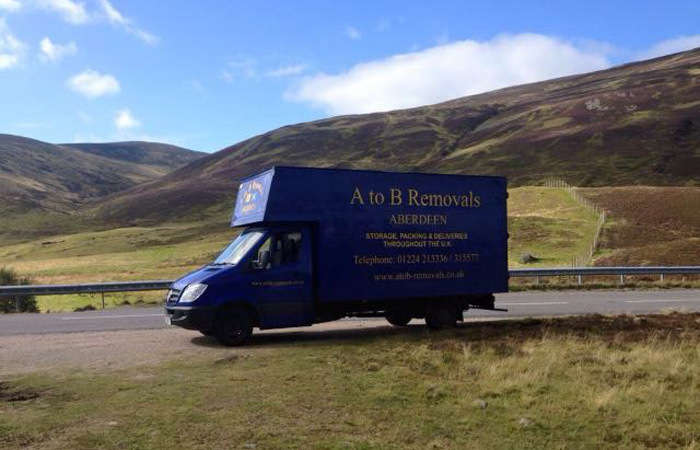 A to B Removals Aberdeen are specialists in office, commercial and business removals. Moving business can be a very stressful time and unless it is handled in the appropriate manner it can disturb your core business. Using A to B Removals Aberdeen will help ease the stress on moving day. We have been moving homes for many years and we understand our clients' individual requirements from top to bottom. Our modern fleet of vehicles range from small (ideal for the first time move) to large furniture vans suitable for the largest home. All our staff are fully trained in all aspects of furniture moving. Please contact us at A to B Removals Aberdeen on 01224 213 336 or 01224 315 577 for all your removal needs including home removals, office removals, man and van and furniture removals.